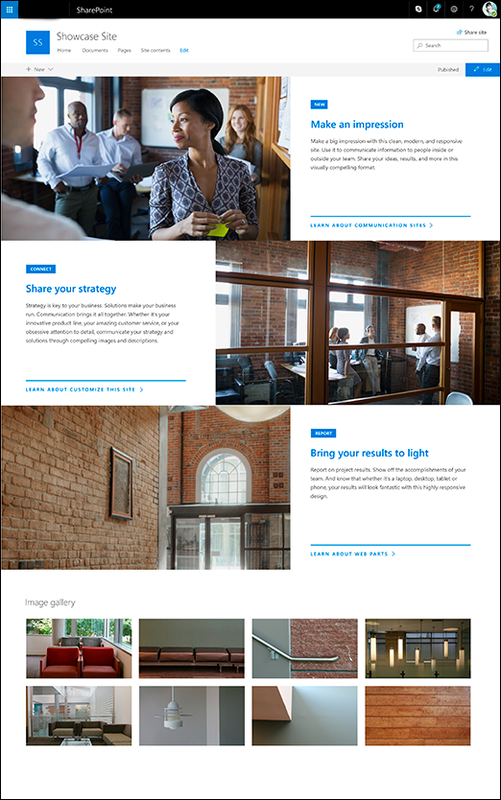 What is a SharePoint communication site? Note: Some functionality is introduced gradually to organizations that have set up the targeted release options in Office 365. This means that you may not yet see this feature or it may look different than what is described in the help articles. What does a communication site include? Topic to share information such as news, events, and other content. Showcase to use photos or images to showcase a product, team, or event. Blank to create your own design. No matter which one you choose, you can add, remove, or reorder web parts as needed. If you have permission to edit the site, there’s also a link at the top of the communication site to add a new list, document library, page, news post, or web app to the site. 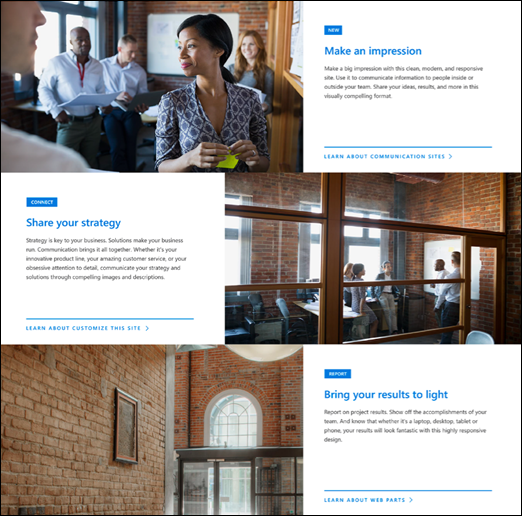 Hero: Use the Hero web part to bring focus and visual interest to your page. You can display up to five items in the Hero web part, and you can add compelling images to draw attention to each. For more information, see Use the Hero web part on a modern page. News: You can keep your team in the loop as well as engage them with important or interesting stories by using the News web part. For more information, see Use News Headlines and News List web parts on a modern page. Events: Display upcoming events using the events web part. For more information, see Use the Events web part. Highlighted content: Use the Highlighted content web part to dynamically display content from a document library, a site, a site collection, or all sites. By default, this web part shows your most recent documents. For more information, see Use the Highlighted content web part. Hero: Use the Hero web part to bring focus and visual interest to your page. With the Showcase design, you can choose from two layouts, Tile and Layer, and add compelling images to draw attention to each item. For more information, see Use the Hero web part on a modern page. Image gallery: Use the Image gallery web part to share collections of pictures on a page. For more information, see Use the Image Gallery web part. When you start with a blank communication site, there’s no need to remove web parts you don’t need. Just choose your page layout and add the web parts you want. 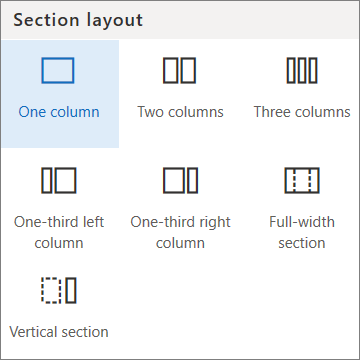 In addition to changing the order of web parts on a page, you can also change the page layout for any of the site designs. For more information, see Add, remove, and change columns on a page. 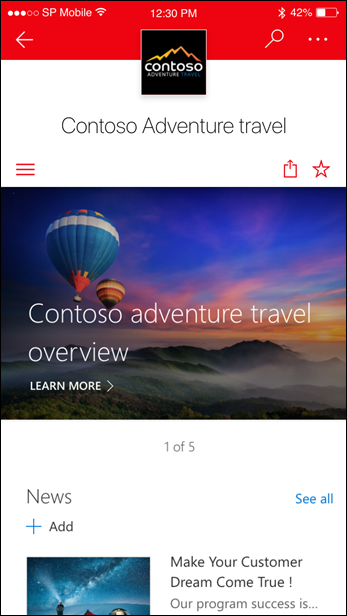 Communication sites dynamically pull in content from across Office 365. 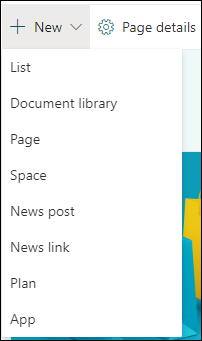 To do this dynamically, and with flexibility, SharePoint pages use web parts, which you can configure to your needs. You can add files, videos, images, news, Yammer feeds and more. Just click the + sign and pick a web part from the toolbox to add content to your page. The toolbox itself has been updated to expand and more easily find the right web part by category or search. 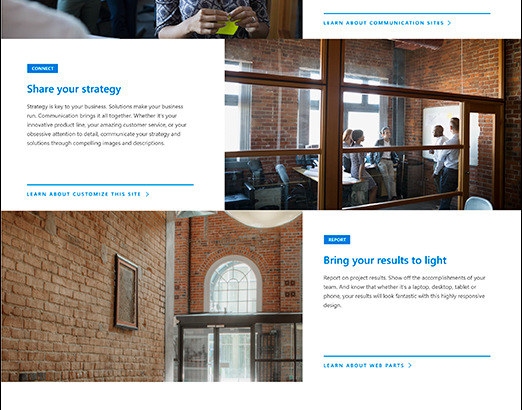 Planner – View Planner plans inside SharePoint pages and news with visual Kanban task layouts and beautiful plan overviews. Microsoft Forms – Create your survey at forms.office.com, grab the final Share URL and display your surveys right within the SharePoint user interface. You can choose to show the results after the user submits the form, too. Group calendar – display your Office 365 group’s upcoming and past calendar meetings and events. Connectors – we will begin to bring in the value of Office 365 Connectors that provide connection to numerous third-party services like Facebook, Bing News, Jira, GitHub, Stack Overflow and up to 100 existing connectors – with more coming over time. 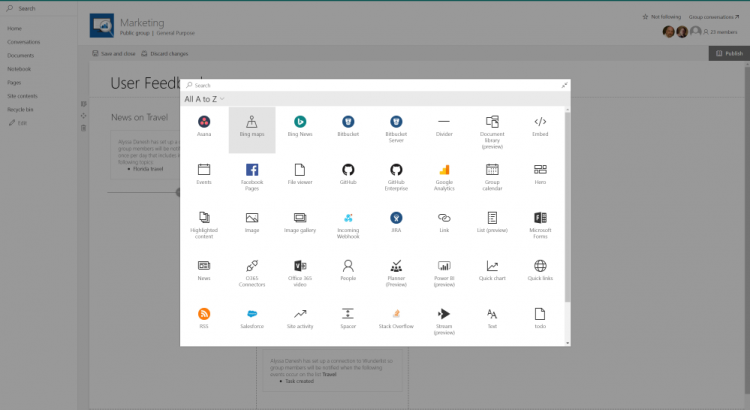 File viewer – Beautifully, visually highlight over 270+ file types from within SharePoint pages and news article. This web part is an update (+ name change) to the Document web part, and continues to support embedding Word, Excel and PPT, and now renders PDFs, 3D models, medical images, and more. Twitter – bring in live tweets from chosen Twitter handles, specific collections or via search keywords. It’s always nice to show the live context of what’s being said externally right alongside the context of what you are working on internally. Spacer & Divider – simple web parts that give you the ability to add physical space between web parts, or a visual line in between. 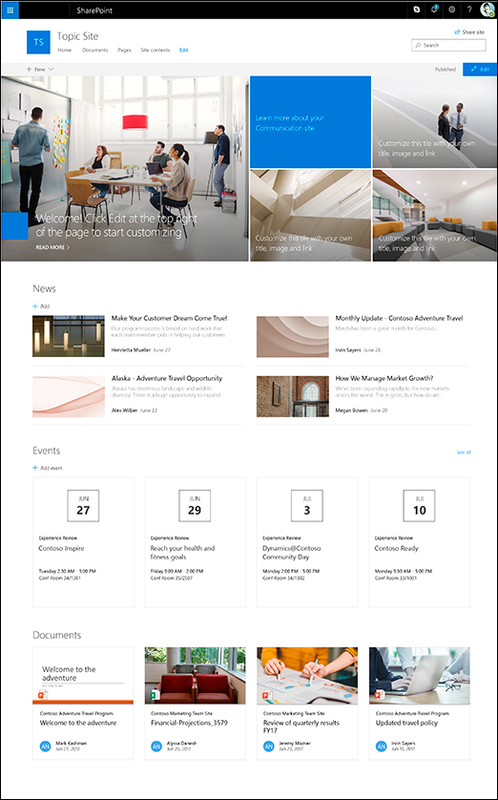 Yammer – Now out of preview, the Yammer web part can be programmed to showcase a Yammer group discussion, and it looks great in the Web layout of SharePoint pages and news articles and when viewed within the SharePoint mobile app (iOS, Android and Windows Mobile). Image – You can pull in Bing Images that utilize the Creative Common license to enhance your pages and news (you are prompted to review the image licensing). You, too, can pull images directly from a specific document library. And once your images are on the page, you can edit them inline with simple gestures like adjusting the ratio and cropping. Text – the rich text editor web part now gives you greater control for how your text appears. From the simple command bar within the web part, select the ellipses to display the broader set of choices in the edit pane, like font colors and highlights, plus table creation and editing. People – a new Descriptive display shows more profile information with room to add custom links and descriptions per person. Events – greater control of the preferred date range to show upcoming events, plus the ability to see each instance of recurring events. Highlighted content – Ability to choose from a specific document library as the source, more design and layout choices like Filmstrip and Masonry, plus additional filtering mechanism to refine by document type and control metadata mapping to influence the display of the search-based results within the web part. 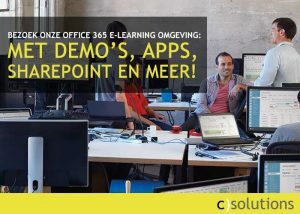 SharePoint Communication sites are now rolling out to Office 365 First Release customers, followed by full worldwide rollout to Office 365 customers in the coming months. Want to Get a Look at the New Communication Sites? Here’s a Trick!